There are approximately 145 sheets per roll. 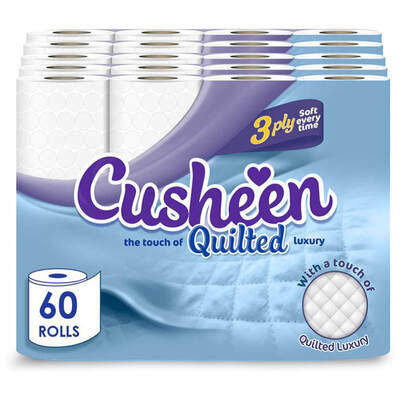 Manufactured by a leading brand in toilet hygiene, the Cusheen 3ply Luxury Quilted Toilet Tissue 12pk is a bulk buy purchase for smaller care homes or educational facilities. Cusheen's premium line of tissues, each roll features soft yet strong tissue with a lightly quilted design that is gentle on skin even after repeated use. Perfectly sized to fit on any toilet roll dispenser or stacked in your utility cupboard, this multipack offers 60 rolls of gently soft tissue, making this a highly economical option in every situation. Fully absorbent and perfect for mopping up spills or soils, choose luxury for your patients, pupils and visitors today.